With its 2.3 cubic foot firebox, the Osburn 2000 insert offers an alternative to the people who love its freestanding counterpart. You would use this option if you can not remove product from back of shipping truck. With its 2.3 cubic foot firebox, the Osburn 2000 insert offers an alternative to the people who love its freestanding counterpart. The two models share the same high quality combustion properties and many of the same features. The Osburn 2000 comes with a standard high-power, heat-activated 130CFM fan strategically positioned to redistribute the heat from the firebox into the room. The 2000 model is designed to receive an optional faceplate that can cover a masonry hearth up to 32 inches (81 cm) high and 50 inches (127 cm) wide. The door overlay is available in black, golden fire brown, gold plated or brushed nickel plated finishes. The faceplate trims are available in black, brassy gold, and nickel. Recommended surface 500 to 2,100 sq.ft. Maximum output - EPA test wood 49,000 BTU/hr. Maximum output - seasoned cord wood 75,000 BTU/hr. Minimum fireplace opening Width: 29"
Centre line of flue outlet to the back 6 13/16"
Centre line of flue outlet to the side 13 7 /16"
Door opening dimensions Width: 17.5"
We are a Authorized Osburn Internet Dealer. Only Stoves & Inserts sold by a authorized dealer have the Osburn Warranty. The 1100 insert is the ready-made solution for smaller stone fireplaces. The 2200 insert, with its focus on efficiency and elegance, is an excellent example of Osburn's know-how. The 2300 model, one of our new-generation wood stoves, comes from the drawing board to you, backed by the advanced technology of Solid-Edge, a 3-D software design program. 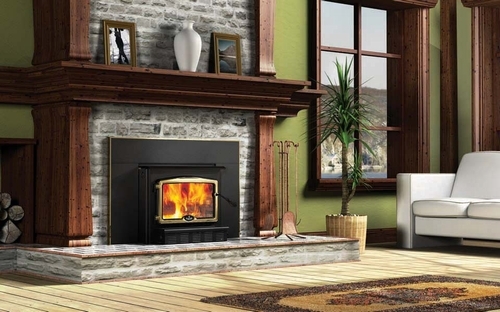 The 2400 insert has the same firebox as its freestanding counterpart, and will transform any conventional decorative fireplace into a highly efficient heating system.